(There is a theory that ‘APOLLO’ denotes a set of concepts and ideas in music, astronomy , geometry and mathermatics which was widespread in the megalithic era, linked to the Druids and later to the Pythagoreans.. The story goes that ‘Apollo’ left the shrine at Delphi in the winter months to dwell among the Hyperboreans. The suggested explanation is that the two constellations, the Lyre and the Swan, associated with Apollo, were more visible in that era in northern lands in winter. 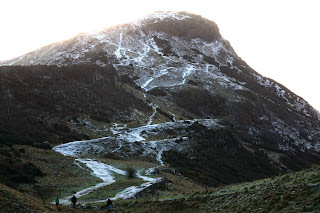 Whether the Hyperboreans can be equated with the Hebrideans is a guess, but in his poem I imagine Apollo spending a winter break on Arthurs Seat in Edinburgh, of which I have a perfect view from my flat. This poem is one of a sequence written throughout the year in 1985, looking from my widow. and huge, cold, omega winter nights. lovely images and the photograph of the 'alpha rock' seems made for it.